Carve the bird like a pro this Thanksgiving. The turkey has been cooked to perfection. It's skin is beautifully browned and the bird has rested for 30 minutes. Now, it's time to dig into the turkey — but the uncle who used to always carve the bird isn't at this year's Thanksgiving celebration. Now what? 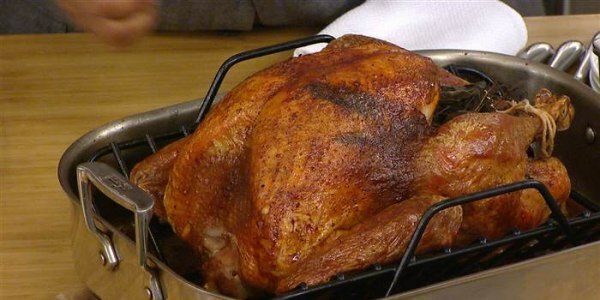 Luckily, superstar chef Bobby Flay and frequent TODAY contributor Elizabeth Heiskell shared their step-by-step guide for carving the holiday bird in the easiest and fastest way possible. 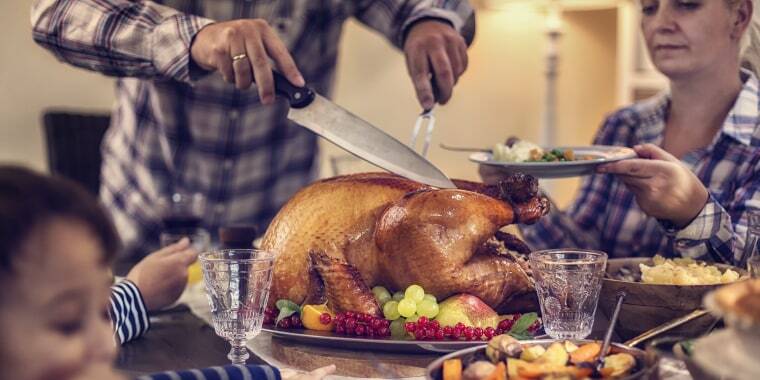 Here are their top tips for how to carve a turkey like a pro on Thanksgiving. If the bird has been stuffed, remove the stuffing and place it in a serving dish. 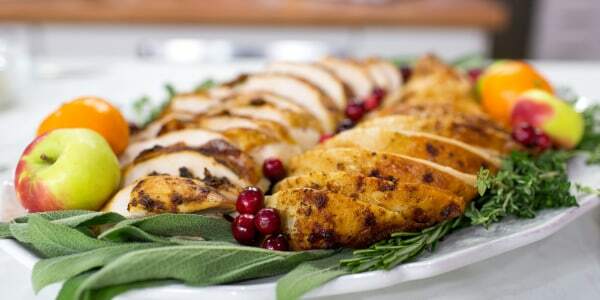 Cover the stuffing so it stays warm as the turkey is being carved. 2. Choose a very sharp knife. "People think sharp knives can cut more people accidentally, but it is actually dull knives [that are more likely to cause injury]," Heiskell told TODAY Food. "[That's] because of all the unnecessary pressure you have to use on a dull knife makes you more likely to cut yourself." An electric knife will also work well in a pinch. Cut away the strand of material that was holding the legs together as they cooked. 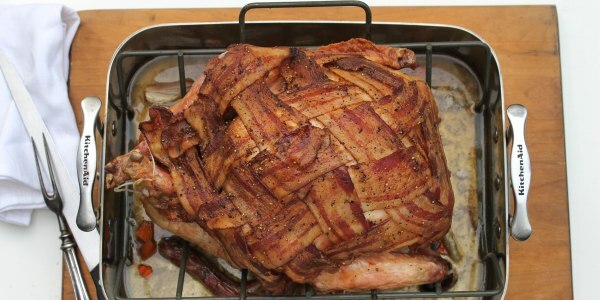 No one wants to end up with a forkful of twine instead of a delicious bite of turkey. 4. Remove one half of the turkey breast. Arrange the the bird so one half of the breast meat is facing your body. "Starting at the center of the breast bone, let the knife follow the inside of the breast bone until it is at the base of the breast," Heiskell said. Next, separate the joint that attaches the leg to the breast. Using the knife, continue to make long cuts along the breast bone until the turkey breast meat separates from the bone. Place the breast on a cutting board, skin side up. Wait to slice it until the rest of the parts of the turkey have been separated. 5. Remove the second half of the turkey breast. Spin the bird around so the other side of the turkey is facing you. Separate the other whole breast from the bone and place the meat on a cutting board. "In movies and on TV, you often see the breast of the turkey being carved from the outside in," Heiskell told TODAY Food. "In reality, it's a much better practice to remove the whole breast." "Start by cutting the skin where the leg joint meets the turkey," Heiskell said. "Using a dish cloth, firmly grab the top of the thigh with force push the thigh down to break the joint, then continue to cut the skin and remove both thighs." Place the legs on a cutting board. The wings can be served whole, since there's usually one person who likes eating the pieces that have more crunchy skin than juicy meat. The wings can also be cut in half at the joint. The two resulting pieces will resemble chicken wings, which are are served as drumettes and wingettes. 8. Slice all of the breast meat into thick slices. "Cut it into slices crosswise, going with the grain of the breast rather than against the grain, like you would have been doing if you left the breast attached," Heiskell told TODAY Food. Place the sliced breast meat on a large serving platter. 9. Cut the meat off of the legs. Separate the drumstick from the thigh at the joint. Slice down the drumstick to remove the meat, being sure to discard all of the long and thin tendons that resemble toothpicks. Slice the thigh meat off of the bones and place the dark meat on the serving platter. 10. Pour on some hot chicken broth or stock. "I always say that the real key to Thanksgiving is chicken stock," Flay told TODAY Food. "I always have some hot chicken stock on the stove." Just before serving the sliced turkey, Flay tops it with the hot broth, which helps reheat the meat. "It brings moisture to it, as well," he added. To store leftovers, Heiskell recommended taking any leftover bits of meat off of the turkey carcass and storing them in zip-top bags. She's found that the bags help keep moisture in the meat, which has a tendency to get a bit dry when it is refrigerated.